WASHINGTON, D.C. -- Two in three Utah residents (65%) are satisfied with the air quality in the areas where they live, but this is the lowest percentage among residents of any of the 50 states. Residents of several of Utah's neighbors -- Nevada, California, and Arizona -- are also among the least satisfied. 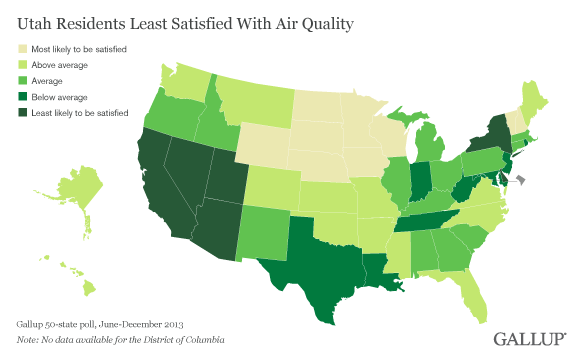 Northeastern states Delaware and New York round out the six states where less than 80% of residents are satisfied with the quality of the air. These results are based on Gallup's 50-state poll conducted June-December 2013. The poll preceded the Obama administration's proposed new emission rules released this week. 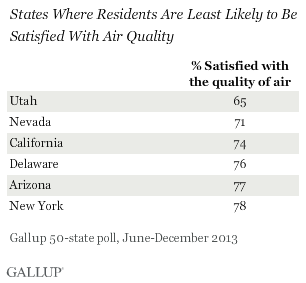 The majority of residents of every state are satisfied with the air quality where they live. Median satisfaction across the 50 states is highly positive at 90%. Some states where residents are less satisfied, such as New York and California, are known for long commutes and traffic, which could negatively affect air quality. But it may be a surprise that residents of other states, specifically Utah and Arizona, are not that satisfied with their air quality. These states are known for their natural beauty -- including five national parks in Utah -- and lower population densities. Utah's 80-mile-long area known as the Wasatch Front, a mountain-surrounded valley where more than half of Utah's residents live, struggles with poor air quality, especially in the winter. A weather effect known as inversion traps air in the valley, blanketing the area with polluted air for days at time. Utah's state government has tried to combat the buildup of smog in winter months by instituting "no-burn periods" when fireplace use and driving are discouraged or banned. Despite these efforts, more than one-third of Utah residents, 35%, are dissatisfied with the air quality where they live. The 50 states can be categorized into five groups based on the percentage of residents who report being satisfied with the air quality in their area. A full list of the state satisfaction levels and rankings can be found on page 2. Across the U.S., residents' perceptions of air quality in their area vary by region, even though satisfaction levels are generally quite high. The states with the lowest levels of satisfaction are concentrated in the southwestern corner of the country, along with New York and Delaware. Meanwhile, residents of the northern Midwest are the most likely to be satisfied. South Dakota, North Dakota, and Wyoming top the list, with 96% satisfied in each state. Minnesota, Iowa, Nebraska, and Wisconsin are also among this group, as are far away New Hampshire and Vermont. These regional similarities may be related to the climate or geography in these disparate parts of the country, or a matter of population density, or some combination of the three, as in Utah. Air quality generally does not appear to be a major problem for residents of most U.S. states. Solid majorities in every state say they are satisfied with their air quality. There are differences in satisfaction, however, ranging from a low of 65% satisfied in Utah to 96% satisfied in the Dakotas and Wyoming. There may also be satisfaction differences within states -- for example, between urban and rural populations. However, the sample sizes in this survey did not allow for that analysis. Leaders in Utah have been attempting to address this issue in recent years, and leaders in other states with lower satisfaction levels have been heeding or should heed the public's dissatisfaction and work to improve air quality or at least perceptions of poor air quality, since bad air can have serious health implications. Air pollution can increase the likelihood of stroke, heart disease, lung cancer, and asthma. Results for this Gallup poll are based on telephone interviews conducted June 27-Dec. 4, 2013, with a random sample of approximately 600 adults per state, aged 18 and older, living in all 50 U.S. states. For results based on the total sample of adults per state, the margin of sampling error is ±5 percentage points at the 95% confidence level. 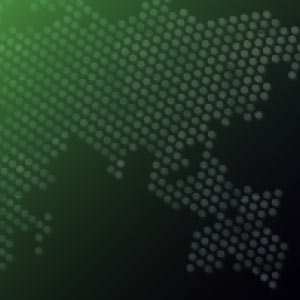 Interviews are conducted with respondents on landline telephones and cellular phones, with interviews conducted in Spanish for respondents who are primarily Spanish-speaking. Each sample of national adults includes minimum quotas of cellphone respondents and landline respondents based on cellphone and landline use in the respective state. Landline and cellular telephone numbers are selected using random-digit-dial methods. Landline respondents are chosen at random within each household on the basis of which member had the most recent birthday. Samples are weighted to correct for unequal selection probability, nonresponse, and double coverage of landline and cell users in the two sampling frames. They are also weighted to match the state demographics of gender, age, race, Hispanic ethnicity, education, region, population density, and phone status (cellphone only/landline only/both, and cellphone mostly). Demographic weighting targets are based on the most recent Current Population Survey figures for the aged 18 and older U.S. population. Phone status targets are based on the most recent National Health Interview Survey. Population density targets are based on the most recent U.S. census. All reported margins of sampling error include the computed design effects for weighting. More than six in 10 Americans favor setting higher emissions standards for business and industry, and imposing mandatory controls on carbon dioxide emissions. Support for these actions is lower now than in 2007 and prior years. Nearly four in five adults worldwide (78%) said they were satisfied with their quality of air where they live in 2012. Perceptions of air quality are similar across all levels of human development.